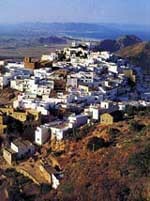 This small municipality in the Almeria province is situated approx. 95 kilometres away from the capital city, situated in the north-eastern part of the province and 95 metres above sea level. Inside Vera we’ll find 7 kilometres of coast with very popular beaches such as ‘El Playazo’ and the beach of ‘Puerto Rey’. There is evidence of Carthaginian settlements in the area, as well as a Roman and Muslim establishment during the al-Andalus period until it was conquered by the Christian armies during the year 1488. The old location of Vera was devastated by an earthquake in 1518, which is why it had to be rebuilt and transferred to its current location which was built in 1520, with a squared shape, 8 defensive towers and a church-fortress built upon an aquifer to man in case of war. The few Muslims converted to Christianity (‘Moriscos’) left there were harassed up to the point where they rebelled forming a riot all over the conquered lands of al-Andalus until they were finally expelled from the peninsula or ran away. Vera’s population had remained stable until it grew considerably in the 20th century thanks to the mining sector (now extinct) and specially to the tourism towards the end of the century and early 21st. Vera is a popular sun and beach destination, one of the best places to practice nudism and with the first nudist hotel in Spain. The accommodation offer in Vera is wide so we won’t have any problems in finding a place to stay. Built after the earthquake that devastated the old Muslim city of Vera as a central point of the reconstruction, in the way of a fortress to defend together with the towers the new location from possible attacks. Convent of the Minimums built in the early 16th century in favour of the relatively unknown order of the Minimums. 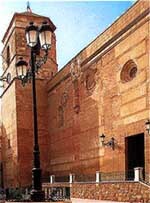 Bullring Built during the year 1879 is considered to be one of the oldest bullrings in the whole of Spain. This place stands out for the preservation of Muslim archaeological remains such as tanks next to an old wall where the towers alternate and where they have also found remains of houses and an oven amongst many other structures. In this museum we’ll discover more about the culture and the archaeological remains of the area. Also, the lovers of nature will be able to enjoy the different trekking, mountain bike and potholing routes. Some of the companies in the area offer the practice of snorkelling, scuba diving or windsurfing. Amongst the recommendable places to visit in Vera and its surroundings, is the Natural Park of Cabo de Gata, Karst of Gypsums of Sorbas and the Desert of Tabernas, where many western movies have been filmed amongst others. Vera is crossed by the A-332 road and the Mediterranean Motorway towards Murcia and Almeria as we can see in the route drawn on the map below. If we go from Malaga airport we can head towards Almeria and from there via the A-7 we’ll reach Vera passing through Nijar. If you need to hire a car with GPS in Malaga, feel free to ask us, at Malagacar.com we offer vehicles with navigators to get to our destination easier.